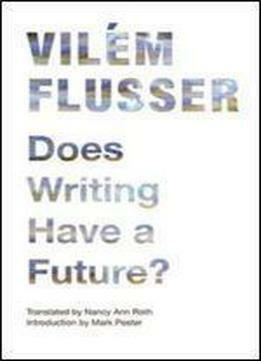 In Does Writing Have a Future?, a remarkably perceptive work first published in German in 1987, Vilem Flusser asks what will happen to thought and communication as written communication gives way, inevitably, to digital expression. In his introduction, Flusser proposes that writing does not, in fact, have a future because everything that is now conveyed in writing—and much that cannot be—can be recorded and transmitted by other means. Confirming Flusser’s status as a theorist of new media in the same rank as Marshall McLuhan, Jean Baudrillard, Paul Virilio, and Friedrich Kittler, the balance of this book teases out the nuances of these developments. To find a common denominator among texts and practices that span millennia, Flusser looks back to the earliest forms of writing and forward to the digitization of texts now under way. For Flusser, writing—despite its limitations when compared to digital media—underpins historical consciousness, the concept of progress, and the nature of critical inquiry. While the text as a cultural form may ultimately become superfluous, he argues, the art of writing will not so much disappear but rather evolve into new kinds of thought and expression.